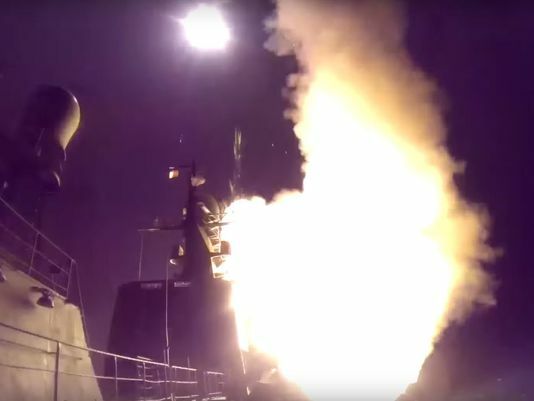 Russian cruise missiles fired from warships in the Caspian Sea struck opposition-held targets inside Syria on Wednesday as Syrian government forces opened a ground offensive against the rebels. BBC reported the missiles were fired from Russian ships off the Iranian coast in southern Caspian Sea, flying through the Iranian and Iraqi airspace before entering Syria to hit their targets. In Moscow, Russian Defense Minister Sergei Shoigu said four Russian warships carried out 26 missile strikes against 11 targets, which he did not identify. “The cruise missiles were fired from the water of the Caspian Sea from 1,500 kilometers (900 miles) away,” Shoigu said in a televised meeting with President Putin today. The comments came after a wave of Russian sea and air attacks that were launched in coordination with Syrian government forces seeking to reclaim territory lost to the opposition in the recent months. The operations were concentrated in the western province of Hama and northwestern province of Idlib. There are information that missiles SS-N-27 were launched from corvette Dagestan and three smaller missile boats and their precision was 3 meters according to Russian commanders. When Gen. Sulejmani arrived in July 2015, he informed that there is a chance to reverse negative developments in Syria and outlined his plans with suggestion for Russia's participation. The plan was approved by President V. Putin and that is what we have now.